A climbing site devoted to women by women. McKenzi Taylor founded Rock Climbing Women in 2013 after moving to a new city as a new climber and looking for more climbing partners, particularly women. She sees RCW as a way to share the thrill of climbing with as many inspiring women as possible. For more about why McKenzi started RCW, read the interview she did last year with Erica Lineberry of Cragmama. To learn more about how McKenzi started climbing, read the site’s very first post! Gear: Belaggles – My salvation! 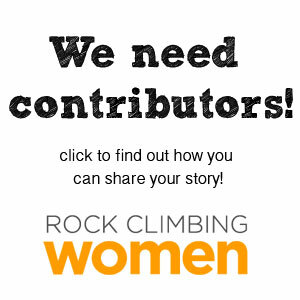 RCW is undergoing an expansion, with the hope that providing more weekly content will connect more women to other climbers in virtual and real life. Want to add to the conversation? Leave a comment or tell us your story. We’re always looking for contributors who want to share their favorite routes, destinations, hard-learned tips, and photos. For more information, visit our contributors page. Want more than online community? Join or start a group. We have groups in Las Vegas and Portland – check out their Facebook pages to meet women in your area and climb on! Live somewhere else? We’d love to help you start a group! Drop us a line.